Crime Ladies | What's not to love about femme fatales? What's not to love about femme fatales? The mission of Sisters in Crime is to promote the professional development and advancement of women crime writers to achieve equality in the industry. You never know what former AMW member Kaye George is up to! She’s very busy and always working on many projects so I thought I’d ask. VPC- Hey, Kaye George! What have you been up to lately? What’s your latest project? I heard you were in an anthology. Can you tell us a little about it? KG- It’s Cooked To Death: Tales of Crime and Cookery. It’s an anthology of mostly Minnesota writers. Each writer contributed a crime story and a recipe, and the food was supposed to play a part in the story. I was invited to submit because I know one of the instigators and thought it was a fun project. The editors are Rhonda Gilliland and Michael Mallory. He’s the one I know. An idea I hadn’t used yet would work for this, I was pretty sure, so I went for it. I love all the things I’m involved in, but it behooves me to get my head out of the clouds and be careful where my feet are stepping. I don’t want to get so tangled up that I trip and fall. I get excited, I get ambitious, I get enthusiastic, and I tend to say “yes” to any and all new projects that come my way. I find out about these projects via networking. A net can be a safety net and it can also be a net that traps you. 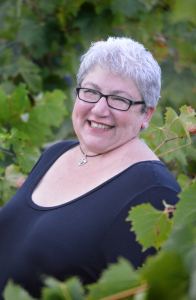 Today we welcome a guest blogger, mystery writer Jeri Westerson! She writes the critically acclaimed Crispin Guest Medieval Noir novels. Her protagonist is a disgraced knight turned detective, plying his PI trade on the mean streets of fourteenth century London. Jeri also has short stories in several anthologies and talks around the country about the Middle Ages, demonstrating her cache of medieval weaponry. Cinda Cyrus left us way too soon. And I didn’t help by fumbling the date of her departure. For some reason, December 17 was solidly burned into my brain as the day she passed on. But, according to her obituary (below), she died on December 19. So forgive me, Cinda and friends, for my error. Cinda would no doubt say it was sloppy journalism and fact reporting and would probably shake her finger at me. Then she would laugh and say I cheated her out of a couple of days and I owed her some blueberry pancakes. So, I’m sending a thought of blueberry griddle cakes from Maxine’s in Bastrop, where we often went for Sunday morning breakfast. Cinda had a number of causes she cared about. They are listed in the bottom portion of the obituary. Alexandra Burt, author of the thriller Remember Mia (also published as Little Girl Gone), will be our guest speaker on Sunday, December 13, 2015. Alexandra, born in Fulda, Germany, made do with a small town library when growing up and became interested in crime fiction and serial killers. After three years of writing classes and gluttonous reading, she decided to tell her own stories. She is an outspoken animal rights activist and she one day hopes to live in a farmhouse and offer old arthritic dogs a comfy couch to live out their lives. She currently lives in Central Texas with her husband, daughter, and two Chocolate Labrador Retrievers. Alexandra will talk about writing and include her own experiences in preparing the same novel for publication in both the UK and the United States. 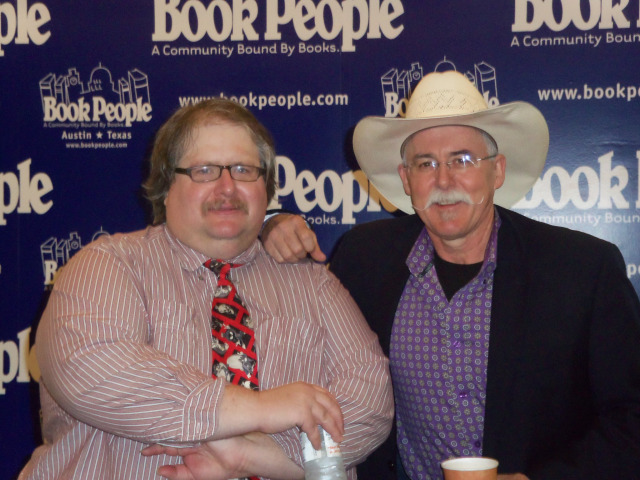 Scott Montgomery poses with Reavis Wortham at Sisters in Crime: Heart of Texas Chapter’s all-day crime fiction workshop co-produced with BookPeople. BookPeople crime fiction coordinator Scott Montgomery will present a mystery panel program called “Authors you don’t know and should,” Sunday, November 8, at 2:15 p.m. at the Sisters in Crime: Heart of Texas meeting at the Yarborough Public Library at 2200 Hancock Drive in Austin. Special guests include Hopeton Hay of KAZI FM 88.7, writers Minerva Koenig and Jesse Sublett, and possible surprise visitors. Prepare to have fun and ask questions. Austin Mystery Writers members Gale Albright, Kaye George, and Scott Montgomery discuss their short stories featured in the new book MURDER ON WHEELS: 11 Tales Of Crime On The Move, on the Sunday, October 25 edition of KAZI Book Review on KAZI 88.7 FM. Listen live online through tunein.com, live365.com, or through their respective apps. 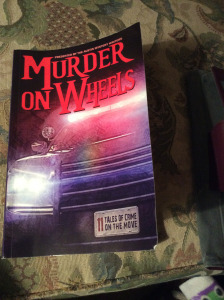 The eleven stories in Murder on Wheels put the pedal to the floor and never let up! Whether by bus, car, tractor, or bike, you’ll be carried along at a breakneck pace by the talented Austin Mystery Writers. These eight authors transport you from an eighteenth-century sailing ship to the open roads of modern Texas, from Alice’s Wonderland to a schoolbus yard in the suburbs of Dallas. Grab your book, hold on to your hat, and come along for the ride! On November 1, 2015, the NaNo will begin. Sharpen your pencils (really? ), sharpen your quills, get out your parchment paper, turn on your computers, laptops, notebooks (both electronic and paper)—and do the NaNo. No, it is not like the TanGo. 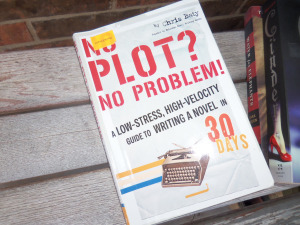 National Novel Writing Month (NaNoWriMo) was started in 1999 by Chris Baty, who thought of a novel (get it?) idea that people could write a 50,000-word novel in 30 days. The NaNo took off and is now a world-wide phenomenon. Chris also wrote No Plot? No Problem in 2004, which is a well-thumbed holy book for NaNoers across the globe. Every November, people who live in Kansas and Saskatoon and New Zealand and Austin listen for the imaginary pistol shot that signals the start of the race to complete 50,000 words of writing in 30 days. This blog is about writing and reading crime fiction. It is dedicated to the memory of those great movie femme fatales from the past, such as Mary Astor, Lana Turner, Jane Greer, Barbara Stanwyck, Gloria Grahame, Bette Davis, and Rita Hayworth. 55 and counting . . .